China’s lunar probe Chang’e-4 is on the streak of breaking space records as it became the first human mission to the dark side of Moon, then it sent out the first panoramic view of the unexplored lunar region and now, it has sprouted cotton seeds to grow the first-ever plants on Moon – this is by-far the first ever biological activity ever happened on Moon. The Chinese Chang’e-4 lander landed on the dark side of the Moon on January 3rd and its six-wheeled rover, Yutu2 sent the panoramic view of the far side of the Moon on 11 January. Besides being the first mission on the dark side of Moon, the China National Space Administration (CNSA) has sent out a mini lunar biosphere inside a canister to test out photosynthesis on lunar surface. Along with the little biosphere, CNSA packed seeds of cotton, rapeseeds, potato, Arabidopsis seeds, yeast and fruit flies to the moon mission. The seeds were placed in special aluminium alloy boxes that contained soil, air, water, a heat control system and two small cameras; and were dormant during 20 days journey from Earth to the moon. Once the probe successfully landed on moon, a command was given from the control stations on Earth and seeds were watered. 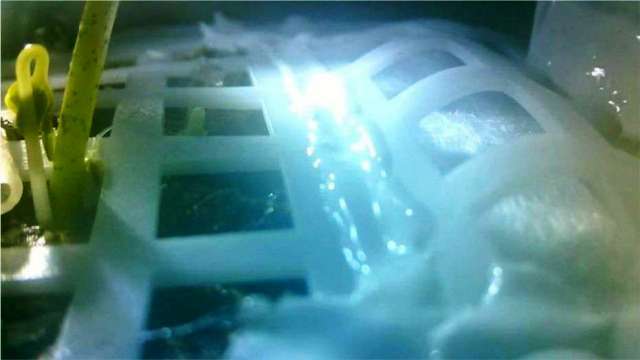 As per the pictures received by CNSA, one of the cotton seeds has already germinated in the biosphere canister – marking the first plant ever grown on the Moon and the first biological activity ever happened on lunar surface. Not just that, this is the first time a seed is being sprouted on a solar system outside the earth in a lunar mini biosphere. The CNSA expects more seeds to sprout in coming days, and it is a breakthrough achievement that can help scientists to grow more vegetables on the Moon in future missions. No such experiment ever has been conducted as it is not possible to simulate moon’s environment, microgravity and cosmic radiation on Earth – and vice versa. Albeit this is a huge achievement, but life in a mini-biosphere in a canister will not survive the brutal lunar atmosphere with extreme temperatures and powerful radiation exposure. Apparently, the first plants on Moon are a baby step to a fruitful lunar mission in future.